Journalist Curt Riess was doggedly following the collapse of the Nazi empire and the relocation of it’s assets to other parts of the world, all in 1943 before the end of World War 2. In this article we continue with my review notes of his heavily documented book – “The Nazis Go Underground”. Picking up on page 70: Himmler and economic minister Hierl set up “cells” of no more than 6 men. The “A” man kept in touch with high officials, the “B” man with the underground. These cells infiltrated government and industry. This structure was organized by SS General Fritz Kaltenbrunner and was watched closely by an underground Gestapo. SS General Werner Heissmeyer was considered to be “a perfect Aryan”. After WW1 he joined the Freikorps, an organization that assassinated “German traitors”. They created the “Heimschulen”, or sabotage schools that trained the emerging underground. Many of these (the Ordensburgen) were trained to go to other countries and not be recognized. Nazis were installed in all public works facilities (water, power etc.) so that if they were removed from office the system would collapse. The German Red Cross also served as an ideal front for the underground, and an estimated 250-300,000 SS members were infiltrated into the national police forces. Beginning at page 100, Author Riess provides details of pro-Nazi Americans – beginning with Senator Gerald Nye. After initially serving as a new-deal liberal who ran The Nye Committee investigating munitions profiteering, Nye was shown to be an anti-Semite. He was associated with The German-American Bund, The America First Committee and was praised by Nazi publications in America. Riess details other Senators that supported fascism. The America First Party was run by Gerald L.K. Smith, and claimed over 3 million members. The Nazis collected every pro-Nazi American publication they could get their hands on. to bolster his intentions. In another scandalous article, The Chicago Tribune published an article stating that the U.S. was aware of Japanese fleet strength, with Naval Intelligence denying that they were the source of the leak. After the attack on Pearl Harbor, Riess claims that an estimated 5-6 hundred American fascist organizations went underground. At the time, the designation “nationalist” became a code word for fascist. Much like today’s “conservatives”, these groups viewed this as a fight between nationalism and internationalism. Author Riess speculates about how America will appear and operate when fascism arrives stateside. I think we can look around and get a pretty good idea that it is here now. At page 135 Riess goes into the history of German immigration into the U.S.
Pre-1871 many Germans were interested in returning to Germany to purge the Kings, Priests and money from the system. After 1871 they turned their interest to American business ventures. Riess claims that Germans did not get involved in sabotage in World War 1, but in 1929 the emerging Nazi Party began to take interest in German-Americans. 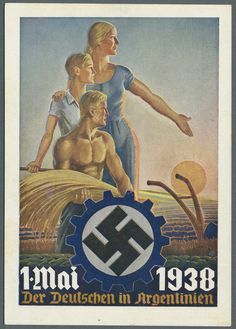 German propaganda attempted to connect with the impoverished German-American middle class with a promise of a better future through The Third Reich. “The Friends of Nazi Germany” was formed in New York – recruiting spies, information, economic and business intelligence and all available war resources. The FBI finally caught on and broke up the organization. The “A.O.” (Auslandsorganisation) was the league of Germans abroad. They were sent all over the world and provided cover for Nazi cells. In 1934 Hitler described these individuals as “listening posts”. The AO organized millions of German sympathizers in support of the coming Nazi underground. For instance, there were an estimated 200,000 Nazis in Argentina alone. Do not underestimate the importance of Argentina to the Nazis, German farmers and businessmen were granted monopolies over exports and imports into Germany. By the end of 1939, the Nazi army in Argentina numbered more than 8,000 men, with an additional 64,000 S.A. “Storm-troopers”. Hitler had his own private army in Argentina, and Riess states “Indeed, the situation in Buenos Aires is such that the Nazi underground works openly while those who fight it must work underground”. written off. After Germany was defeated, Argentina continued continued collaboration with Germany to recover some of its money. Argentine banks handled all German transactions. The same banks also served as fronts for Swiss and Swedish holding companies that also managed German investments. Arms were sent through Spain, from Germany to Argentina. German military training in South America tracks back to 1911 when General Wilhelm von Faupel trained Argentine troops, later in Brazil and Peru. Riess writes “He did not return to Germany until the nazis were about to take power”. Riess further states that von Paupel was responsible for the Spanish civil war because Spain was the key gateway to South America. As it was, Spain was an important player as Germany faced collapse. The Nazi/fascist movement in Spain was called “The Falange”, and the Ibero-American Institute was the diplomatic arm of this organization. Reiss begins around page 168 describing the espionage operation run by Franz von Papen which was stalked by British intelligence. Those operations moved into the middle east. The machine that was built to serve the Nazi regime would later serve the Nazi underground. The Germans were worried that the Russians would be ruthless In an effort to punish the Germans. As a result, the Germans believed that the Americans and the British would not be as dangerous to the Nazis as the Russians. Riess could not imagine that the future Nazi – CIA relationship would be so close. At this point we approach the conclusion of “The Nazis Go Underground”. Riess goes on to report how German youth will be recruited through The Boy Scouts and youth sports clubs. But one more big point needs to be made. In fact, Riess provides an alternative history for Niemoller. Niemoller was listed as a possible future president of Germany. He had eventually protested against Hitler’s interference with church matters, and was put into a concentration camp. Niemoller’s history was somewhat the opposite of what most people understand. He came from a very right-wing German family, was a world War 1 U-boat commander and a member of the violent Black Reichswehr. He was a member of The Nazi Party until 1933. Author Curt Riess states: “If Hitler had left religion alone, Niemoller would have never have fought him. Niemoller spent years in prison and was released when he volunteered to be a U-boat commander again. Riess states: Niemoller was a Nazi from the beginning and will always remain a Nazi. (Pages 182-183). Well, as the reader can see, the Nazi underground was well planned, well funded, and survived into modern times. There is no telling where they reach their corporate hands. Corporations that will run governments, international affairs and resource extraction. We see them in the “Dirty Wars” in Central and South America, Africa, Asia and the middle east. You see them in the pharmaceutical industries, the Bayer and Monsanto merger, and the like. They are the partners of U.S. intervention, under the guise of “humanitarian bombing”, responsibility to protect (“R2P”), and in global trade agreements. After the reuniting of East and West Germany, they have steadily achieved all their European war-era goals. Southern Europe is their pool of cheap labor, as are the tens of thousands of refugees from U.S. And NATO instigated wars in the middle east. Germany is still the industrial powerhouse of Europe, and there are plans for an E.U. army that will largely be under German control. Author Curt Riess was seeing the path being cleared for a version of global governance, one with a softer appearance, yet still with an iron fist. This entry was posted on September 20, 2016 at 4:36 pm and is filed under Hidden History, Nazis. You can follow any responses to this entry through the RSS 2.0 feed.